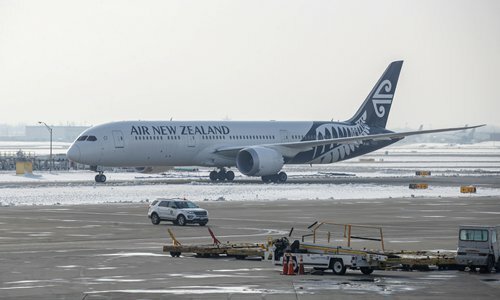 An Air New Zealand flight finally arrived in a Shanghai airport Monday morning after being turned back for failing to get a landing permission in China. Air New Zealand flight NZ289, with about 270 passengers on board, took off from Auckland at 11:45 pm Saturday (local time) but returned after a four-and-a-half-hour flight, news.com.au reported on Monday. The airline issued a statement on its Sina Weibo account on Sunday that the return flight was due to the improper deployment of the aircraft, which did not obtain a landing permit in China. Air New Zealand later changed aircraft. Flight NZ289 arrived at the airport's Terminal 2 Monday morning, an employee from Shanghai Pudong International Airport, told the Global Times on Monday. "We know that this incident has caused great inconvenience to all passengers, especially those who just celebrated a wonderful Spring Festival holiday in New Zealand. We apologize for this and will do our best to reduce the impact on passengers," the statement said. The statement added that Air New Zealand distributed airport catering coupons, airport shopping vouchers and taxi tickets to the flight's passengers, and most booked hotels. Chinese regulations on foreign public air transport carriers published by the Civil Aviation Administration of China in 2004 state that foreign applicants should submit the type, nationality and registration mark of the aircraft to China's civil aviation authority.